"People are inherently interested in how these skeletons look," said W. Leo Smith, associate professor of ecology and evolutionary biology and associate curator at the University of Kansas Biodiversity Institute & Natural History Museum. "In any given scholarly paper, you'd be lucky to have a couple of hundred people read it top to bottom — but a lot more people will look at the images. The more we can improve that, the more people you can get interested in your research." Since the 1800s, biologists and paleontologists have taken pictures of specimens to perform comparative anatomical studies. Now, techniques pioneered by Smith and a team of researchers headquartered at KU are giving scientists around the world fresh methods to capture images of vertebrates — a breakthrough enabling better, more useful digital pictures of Earth's biodiversity. One new process involves "cleared and stained" specimens, which have been stripped of their muscles in a time-honored technique using cow enzymes. The team discovered how to position such specimens within a glycerine-gelatin mixture for otherwise impossible images. "The problem we had was we couldn't pose these animals because we've digested away all of the muscles," Smith said. "They're flaccid and useless, like a pile of clothes that fold in every direction. We wanted the ability to pose them." The researchers hunted for the best ratio of glycerine and gelatin that allowed specimens to be posed in a nondestructive medium that could be simply washed off after photography. Much of the "nitty gritty" work was performed by doctoral student Matthew Girard and intern Chesney A. Buck, an aspiring taxidermist interning with Smith's group from Van Go Inc., an arts-based employment program for at-risk teens and young adults. "She was interested in artistic taxidermy, mixing animal parts like have been done with the jackalope," Smith said. "She knew about clearing and staining and wanted to know how to do it. After her internship, she volunteered for a year more. There was a lot of trial and error. We tried lots of different things." Other co-authors on the new paper are Gregory S. Ornay, Rene P. Martin and Girard of KU's Biodiversity Institute, along with Matthew P. Davis and Sarah Z. Gibson of St. Cloud State University. Eventually, the team found a 40 percent glycerine mixture that held specimens well and was sufficiently translucent for photography, allowing them new looks at specimens that could "float" within the matrix. "You can see through this medium and give the specimen structure," Smith said. 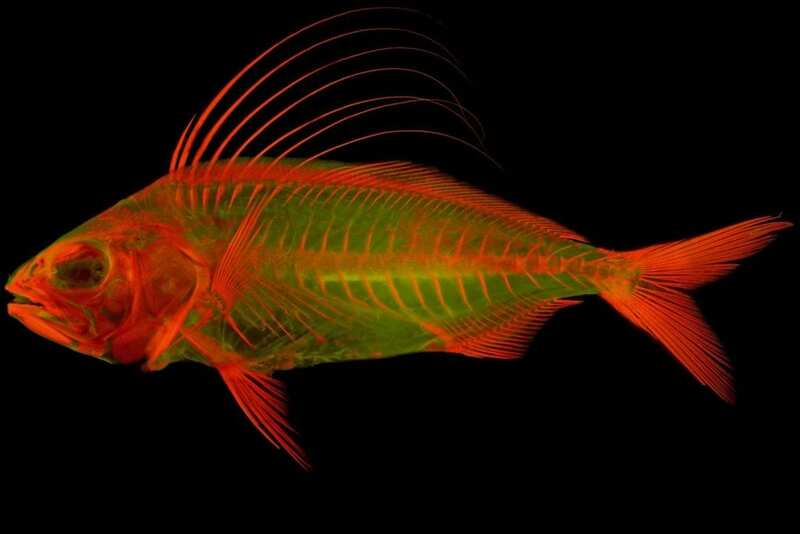 "Now you can get a photo of a fish specimen head on and look at it from all these different angles. There's something different about being able to see anatomical structure in new ways that really does help analysis. Before, we struggled with how to pose these things. For instance, fish are famous for having two sets of jaws, an oral set like ours and then another set of teeth where our voice box is — you couldn't get a photo of these teeth head-on before now." "It'd be great to pose a snake coiled, but before now they just wouldn't hold in that pose. Or if you were trying to get an image of some structure obscured by the wing of a bird and couldn't get it out of the way, we've often had to cut the wing off, but now you could deflect the wing to show that structure." "Alizarin red is used to dye a specimen's bones, and it fluoresces like a Grateful Dead poster," Smith said. "We use lights that have high energy and look for reflections of re-emitted fluorescent wavelength, and the microscope has filters that block all the other light. The skin and everything else disappears because it doesn't fluoresce — it's a fast way to clear out all the extra stuff and is incredibly useful when you're trying to see where bones are connected. It was pure luck to find this." "Now lots of people are doing it," Smith said. "It's been really rewarding. You feel like you contributed something to make this kind of research more interesting and allow us to study anatomy better." While Smith doesn't consider the how-to descriptions of new imaging techniques to be of equal weight as the scientific papers he regularly produces, he stressed the importance of providing compelling images to conveying information to fellow investigators and the public alike. "At end of the day, the picture is worth a thousand words," he said. "Images allow you to fundamentally share how things work and improve your ability to tell someone else about your novel discoveries."